At Joe Horrox Law, we fight for the rights of the injured and their loved ones. Serving clients from Edgewater and throughout the state of Florida, we take extra care when it comes to large truck accidents that result in injury or death. While large trucks themselves are dangerous, the objects that they are carrying along the interstates and highways also pose dangers. Let's consider these matters right now. We already know that large trucks can cause major injuries and accidents on the road. Truck drivers deal with major blind spots and the tremendous amount of force generated by a collision with a large truck can lead to severe injuries and even death. Yet sometimes the cause of serious injuries when it comes to large trucks has less to do with the trucks themselves and more to do with their cargo. Indeed, the cargo of large trucks can cause serious accidents. If cargo from a large truck falls onto the road, there are major dangers that can contribute to accidents occurring. For one, large items that fall onto the road can be a major collision hazard. This is especially true if a truck is hauling steel drums, mattresses, major appliances, or even other vehicles. These collision hazards can also make vehicles swerve, increasing the chances of sideswipe accidents as people veer into other lanes to avoid harm. The cargo on the road can also lead to issues with people's tires. Punctured tires can occur if there is broken glass, nails, or other kinds of sharp objects on the road, for example. Issues with tire traction are also important to consider, such as when liquids or fine particles (e.g., sand) fall from a large truck. 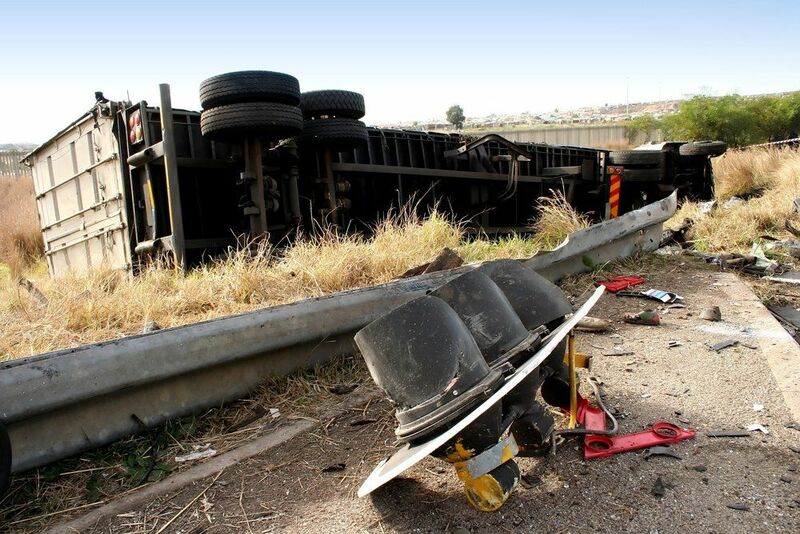 Another major danger of truck cargo accidents is when the poorly secured cargo falls onto other vehicles. This can be extremely dangerous when it comes to larger objects, like appliances or even huge construction materials such as pipes and girders. Cars can be crushed due to the weight of these major items, leading to extreme injuries. Even smaller objects falling from trucks can lead to major issues when they strike adjacent vehicles. We mentioned sideswipe accidents above. It's instinctual to try to avoid falling objects while driving, so there is an increased chance of swerving to get out of the way. When this happens, drivers may hit or clip other vehicles nearby, or they may strike medians on the road. Why do cargo problems occur? Many times cargo problems occur because items are not properly secured or the vehicles are overloaded in order to haul more items. Both of these are negligent actions, and great care should be taken to prevent potential cargo slippages or items suddenly become loose on the road. It's important that truck drivers and trucking companies exercise great care when it comes to hauling items on the road. Drivers should periodically examine their loads when stopped to ensure that everything is secure and that nothing has come loose or shifted in such a way that it could come loose. This level of caution and common sense can save lives and prevent major accidents. For more information about truck accidents and what your legal options are following a serious collision, it's important that you contact our personal injury law firm today. The legal team at Joe Horrox Law looks forward to your visit and helping you achieve just compensation following a serious collision.